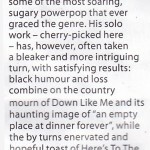 Four stars for Ken Stringfellow in the new issue of Mojo! Sweet Lojinx twofer in the new Mojo!! !